Aroview: Expressive, bittersweet French stop-motion animated feature about a boy (Courgette) who must adjust to life in a foster home of orphans, who each have childhood traumas they are overcoming. Based on a script from acclaimed writer/director Céline Sciamma (Girlhood, Tomboy), it entirely suitable for 7-ups despite the "adult" themes. 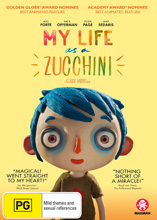 Note: The American dubbed version renames the central character Zucchini to distracting effect, so best watch in the original French option with subtitles.